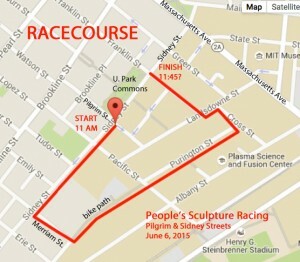 The ghost of the past had the last laugh in the June 6, 2015 revival of sculpture racing in Cambridge, the first such race in 30 years. Bill Wainwright’s Wheel No. 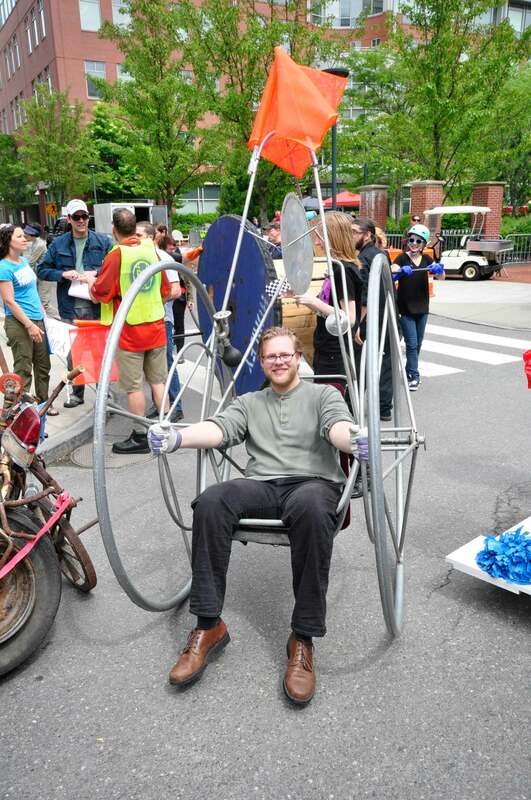 2 and jockey James Herold acquired the coveted first place trophy after two other teams ahead went astray in East Cambridgeport’s lonely technology neighborhood. Wainwright, a celebrated public artist who died in 2012, built the wheel for the first race in 1982. The wheel stood the test of time. In June 2015, it went into final retirement, accessioned by the MIT Museum. James Herold emerging from the Waverly Bikepath ahead of Caterwauler, the second place winner. A. Held photo. 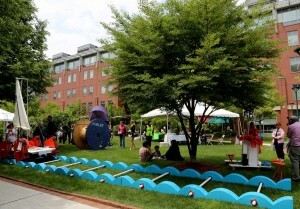 The event by People’s Sculpture Racing revived 1980s races that were a popular component of the Cambridge Arts River Festival. 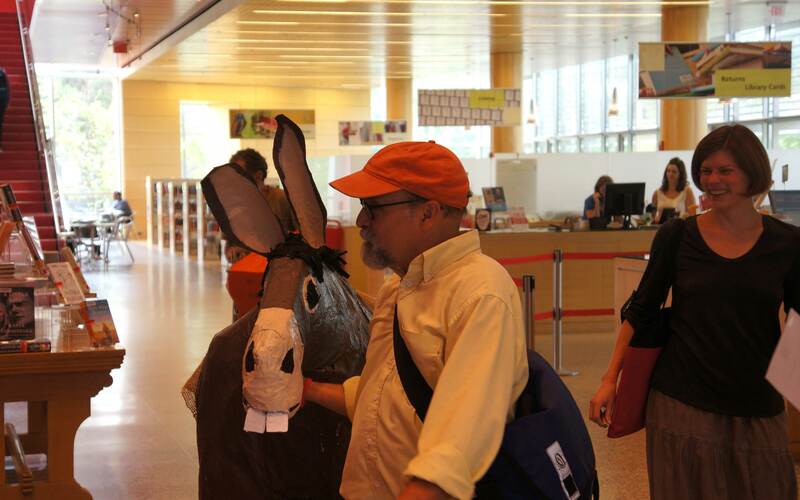 The Festival was displaced this year and last year by construction on Memorial Drive. The World Sculpture Racing Society, directed by Geoffrey Koetsch and Kirby Scudder, ran those races from 1982-1985 and invented this version of the kinetic sculpture racing genre. 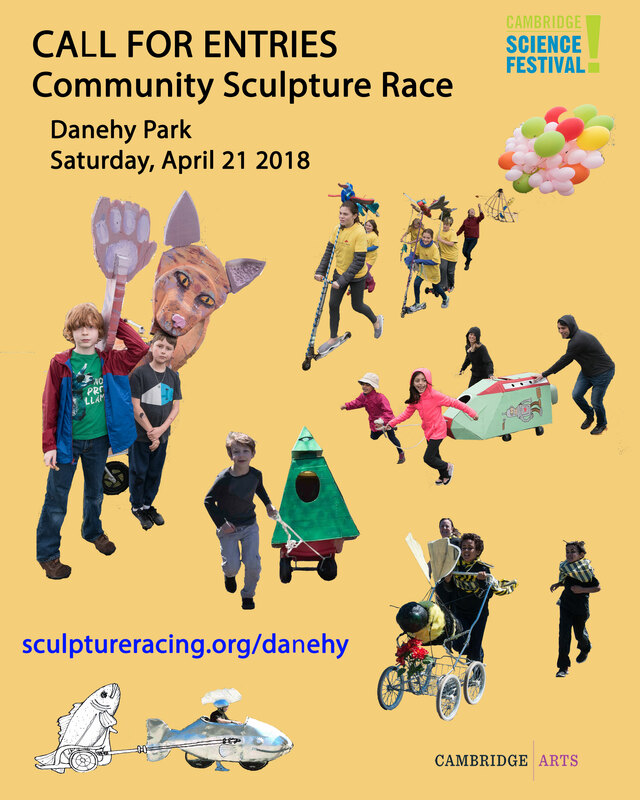 Flock, a flock of gulls on columns with flapping wings kinetically activated by the forward motion of the sculpture, built for this race and jockeyed by PSR Team Members Dennis and T.T. Svoronos and Rory Beerits. Tsunami Wave Machine (Homage to Hokusai), with rolling waves surfed by mermaids, built for this race and jockeyed by Steven Hahn. 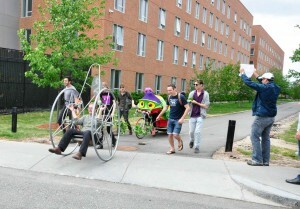 Sis-y-phus, a sailboat on square wheels that rolled on a half-moon track that had to laid ahead of the boat along the racecourse, built and raced by Kim Bernard and the Harvard Physics Team dressed as sailors. A descending weight, lifted every few moments by the sailors, caused the wheels to turn. 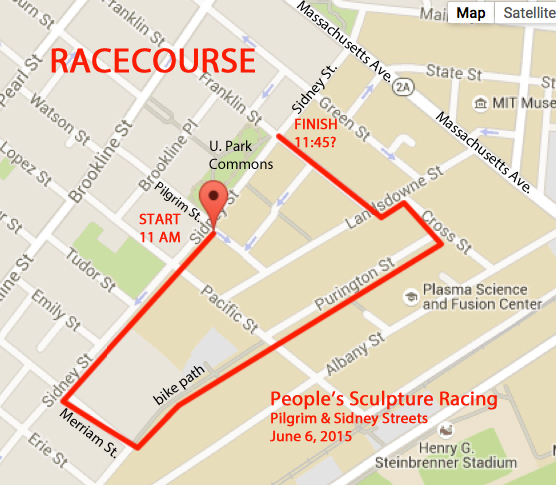 After months of hard work and anticipation by the People’s Sculpture Racing Team, and fresh from our Sculpture Racing Design Exhibition the prior month, we held our inaugural race on June 6, 2015. 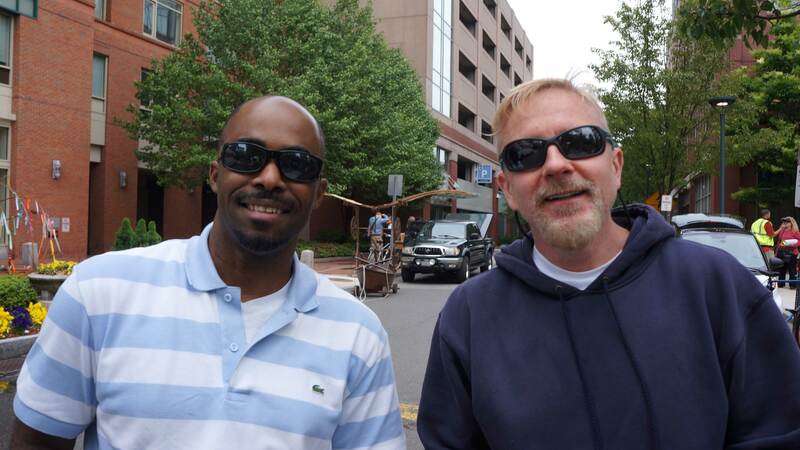 In the runup to the race, PSR Videographer Rock Louis made a number of videos of the team and artists at work. Please see the Videos page. More on the team below. With Raceday just around the corner, Wendy Whoriskey, Ashira Morris, Denise Patnod, and Contender Brenda Be helped with a number of press and social media initiatives. 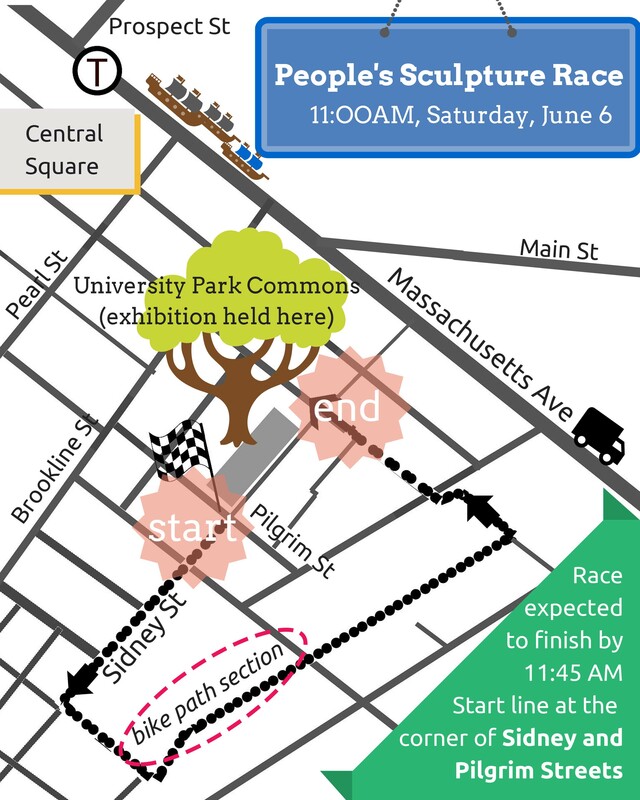 Marc Levy of Cambridge Day wrote a preview, while Contender Kim Bernard inspired Globe Arts Reviewer Cate McQuaid to write a front page Arts preview, “Sculpture Hits the Road for Cambridge Race,” published the day before the race. Contenders arrived at the start line/staging area south of the park around 9 AM and started assembling their sculptures. 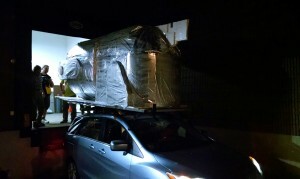 The event crew also arrived–Leah G. and Scott Kyle, Jan Jones and PSR Team Member Judy Haberl, David Eggers and Nicholas Herold, Caleb Martin, Andrew Vitvitsky, Robert Ross, and Katherine Herold. 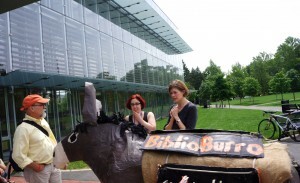 They worked together to erect up giant pointing fingers along the racecourse; direct arriving sculptors; organize event paraphenalia; pass out programs and flyers to audiences; and distribute coffee and donuts to early risers. Led by PSR Team Member Rock Louis, the film crew brought out their equipment and scoped out shots. These included Steve Marx, Simon McDonough, Kent Thompson, and Maurice Wilkey. 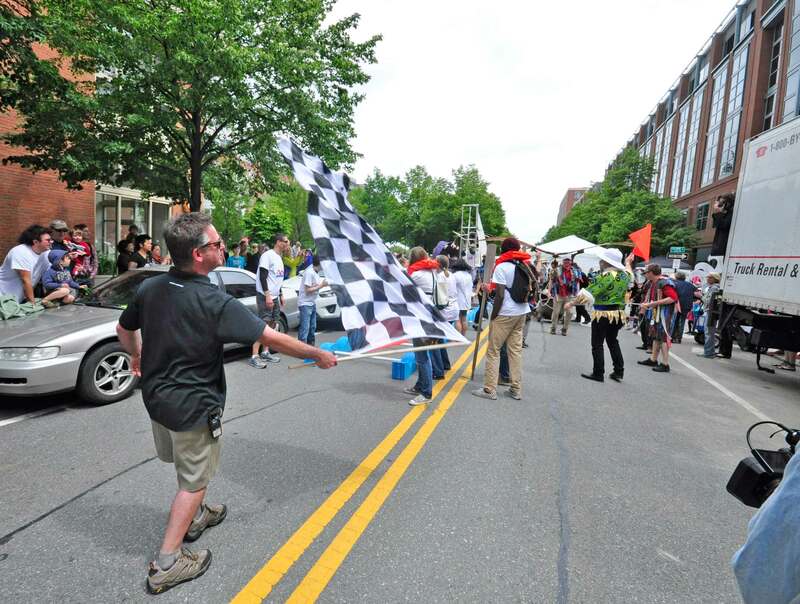 At about 10:20, the event crew and some racing team members held a mini Pied Piper Parade from Central Square to the start line just before the race to lure Festival-goers. As you can see from images in the galleries, the intersection at the starting line was jammed. Spectators also dotted the race route. 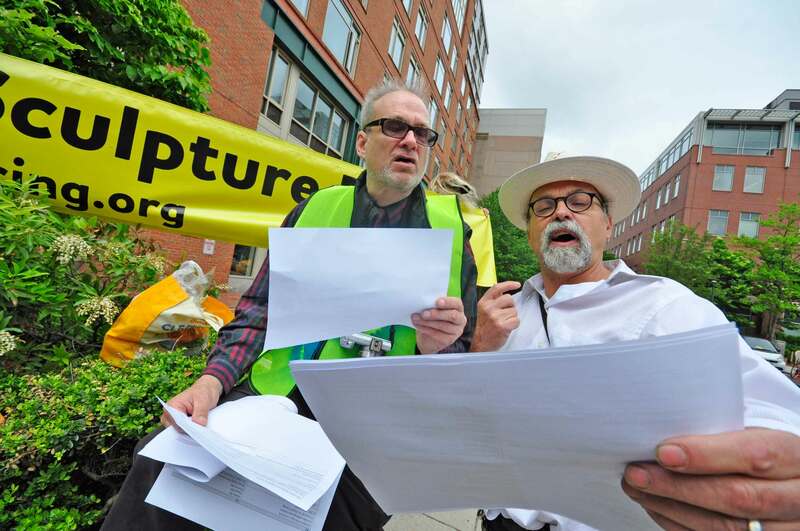 As the 17 Contenders (lineup and portraits) arranged their works and crews at the start line, facing south on Sidney Street at Pilgrim, PSR Director Christian Herold introduced the event. At about 11:15 AM, Jason Weeks whipped the checkered flag down to start the race. 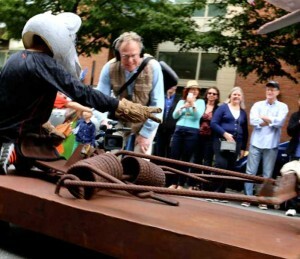 The race started out slowly, as the aggregate width of the sculptures, had they been aligned side-to-side, would have been some 7 times wider than the street. Three sculptors, moreover, incorporated into their designs the intention to come in last. Leonardo’s Flying Machine and Caterwauler held first place for much of the course, with Wheel #2 trailing, but the first two contenders went astray, bewildered in ghostly weekend streets of this hi-tech lab neighborhood. James Herold, racing the late Bill Wainwright’s Wheel #2, with breathless assistance from his brother Ian Herold, finished first. Please see the galleries and news stories for images of the race and exhibition. 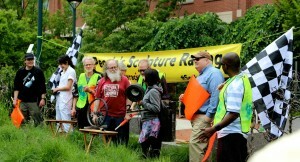 The People’s Sculpture Racing Team gathered during the Exhibition to award trophies to the Contenders. The trophies were made by Contender and PSR Team Member Rory Beerits. River Festival Race Juror Laura Knott passed out trophies. 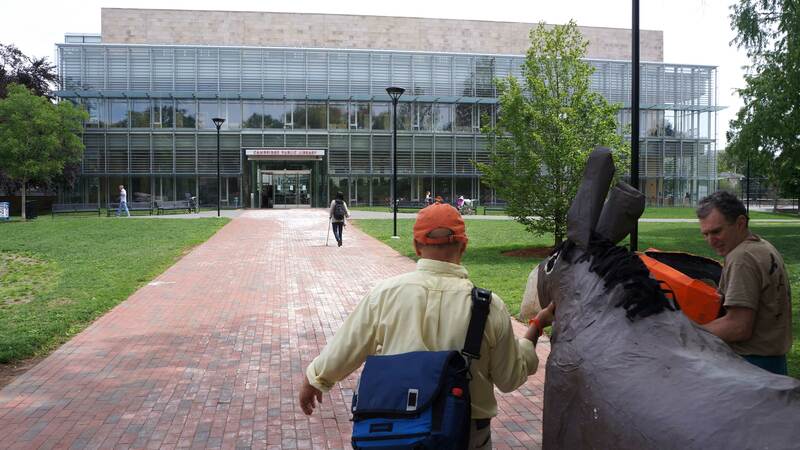 Where Did The Sculptures Go After the Race? 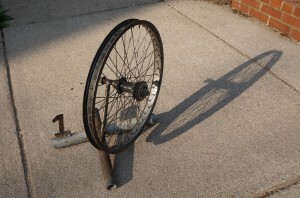 Bill Wainwright’s Wheel #2 was retired following its June 6 victory. 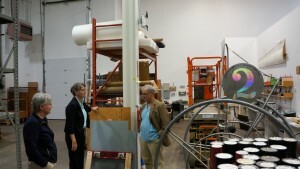 The MIT Museum accessioned owner Lionel Spiro’s donation. 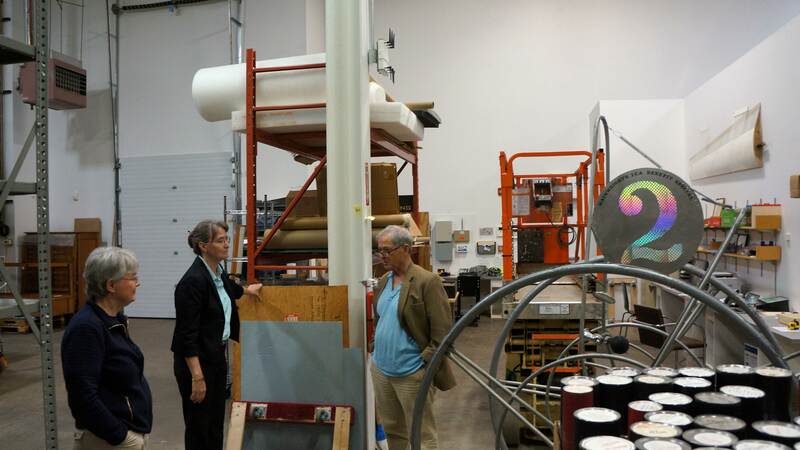 Pictured from left to right are Deborah Douglas, Director of Collections and Curator; Joan Whitlow, Registrar and Collections Manager; and Lionel Spiro, who worked with Bill Wainwright and acquired the wheel decades ago. Lionel is also a sponsor of People’s Sculpture Racing. The Cambridge Public Library’s Children’s Reading Room, in its turn, accessioned BiblioBurro, here led by Scott Ruescher with the help of …… Below we see …..
Jeff Del Papa’s Bedlam Express returns to its hanger at Artisan’s Asylum.